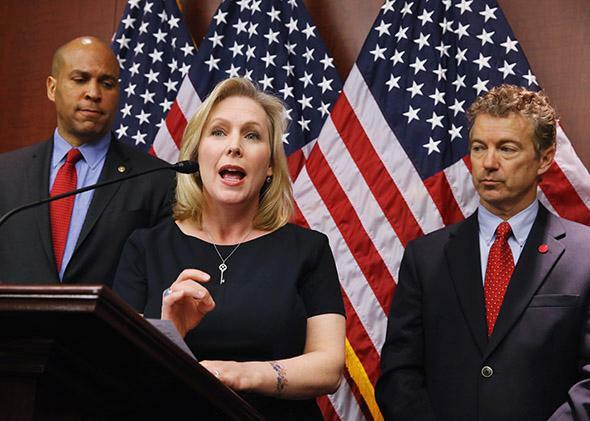 Senate medical marijuana bill: Rand Paul, Cory Booker, and Kirsten Gillibrand’s pot bill is a blueprint for legal weed. Sen. Kirsten Gillibrand speaks about medical marijuana during a news conference with Sens. Cory Booker (left) and Rand Paul on Capitol Hill on March 10, 2015, in Washington. The path from legal medical weed to the recreational stuff isn’t as straight of a line, although the two are clearly connected. Already Colorado, Washington state, Oregon, and Alaska have proved that voters are game to open the door for widespread recreational use. Similar full-scale legalization efforts are at varying stages in more than a half-dozen other states—Nevada, Arizona, and California among them—where advocates are looking toward 2016, when they hope the presidential election will turn out enough liberals to push those efforts across the finish line. As I explained last summer, more than 1 in 5 Americans live in states where smoking pot has a legitimate chance to become legal between now and when Obama leaves office. The biggest potential roadblock to such state-level efforts would be if Washington decides to step in and flex its federal muscles. But its D.C. bullying aside, Congress has actually quietly become increasingly pot-friendly, particularly when it comes to medical weed. While no one expects Congress to vote to legalize pot outright anytime soon—or even to back the type of major reforms that would make it easier for states to legalize medical or recreational weed on their own—a growing number of lawmakers have made it clear they have no desire to stand in the way of those state efforts. Tucked in the same bill that targeted the D.C. legalization effort was a provision that was actually much more important in the larger fight for legalization. Lawmakers voted to block the Justice Department from spending a dime to prosecute patients or medical marijuana dispensaries that are acting in accordance with state law but running afoul of federal ones—a roundabout way of achieving one of the main goals of the Paul-Booker-Gillibrand bill. Still, that policy change isn’t permanent—it will last through this coming September—making it only a symbolic victory unless Congress acts again. The Obama administration, meanwhile, has sent mixed messages when it comes to weed. The president has given a qualified green light to states to experiment with both retail and medical weed. But at the same time that hasn’t stopped the DEA and several U.S. attorneys in recent years from raiding hundreds of medical dispensaries that were in compliance with state laws—nor would it prevent the next president from taking a more aggressive posture. Still, the slow march toward legalization appears to be underway, and the Paul-Booker-Gillibrand bill provides a clear path—not just in policy but also in politics. Booker and Gillibrand represent the traditional liberal support for ending the war on drugs, while Paul provides the states-rights and libertarian logic that appeals to many conservatives. Already, Sen. Ted Cruz and former Florida Gov. Jeb Bush—both of whom Paul can expect to cross paths with during the GOP primary—have suggested they support states’ rights to legalize pot, even if they don’t personally want to see that happen. That rationale has been echoed by a number of congressional Republicans as well and was a key driver in the cromnibus’ medical pot provision. The Senate bill is unlikely to get the consideration it deserves in this Congress. But fortunately for the legalization effort, it doesn’t have to complete the journey to be a success—it only needs to point the way.